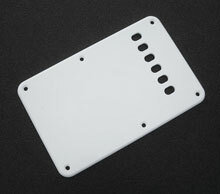 This white 1 ply 0.120" thick Acrylic pickguard with the rounded and polished edge is the same style of pickguard found on Gilmour's Black Strat® with one exception; this pickguard will not have the small slot for the recessed mini-toggle switch to protrude through, this feature has been removed from the design based on numerous customer requests. We offer three options for shielding; 1) No shielding, 2) copper foil shielding in the control region only (click for illustration of this style of shielding) or 3) full coverage aluminum shield. The full coverage aluminum shield is a '62 style genuine Fender® # 001-9699-049 that is 0.012" thick and mounts underneath the pickguard in-between the controls, it is not adhered to pickguard with adhesive. It will have to be mounted upside down for it to be left handed, but that has no detriment to its function. Click here to see an illustration of the full coverage aluminum shield installed. These pickguards are manufactured on an "As Ordered" basis. There will be an approximate 5-10 business day turn-around time from order placement until your order ships. White Acrylic 1 ply, 0.120" thickness. Rounded and polished perimeter edge. Accepts 3 standard single coil pickups (SSS). 3 potentiometer mounting holes, 3/8" in size. Pickup and selector switch mounting holes are NOT countersunk, they will require round head mounting screws. IMPORTANT ACRYLIC CLEANING NOTE: When cleaning any Acrylic pickguard or back plate ONLY USE the following approved cleaners. Use of any other cleaning product may damage the Acrylic. Novus #1, Plastic Clean and Shine. Both of these products can be purchased from a company called "Tap Plastics". Here is a direct link to the item page for the Kleenmaster Brillianize and here is a link for the Novus #1. We now have the matching counterpart back plate to go along with these pickguards that is also White 1 Ply 0.120" Acrylic with a Rounded and Polished Edge. Depicted above in Standard 11 hole mounting pattern, also available in '57 Vintage 8 hole mounting pattern, mounting hole pattern selected below. Each of our 1 ply 0.120” Acrylic pickguards with the rounded and polished edge are custom hand manufactured in our shop specifically for each customer. They start off being cut out of a sheet of Acrylic with a CNC laser which creates the basic pickguard shape with all holes and cutouts. We then create the pickguards round-over edge effect by hand with a table router where the pickguard is affixed to a routing template where we trim the pickguard to it’s final size and create the rounded perimeter edge. From there the pickguards rounded edge is hand sanded with a fine sandpaper to remove any tooling marks left behind by the router bit. The smoothly sanded rounded edge can then be polished with a special buffing wheel and a polishing compound used exclusively for Acrylic which creates the highly polished and glossy rounded edge. 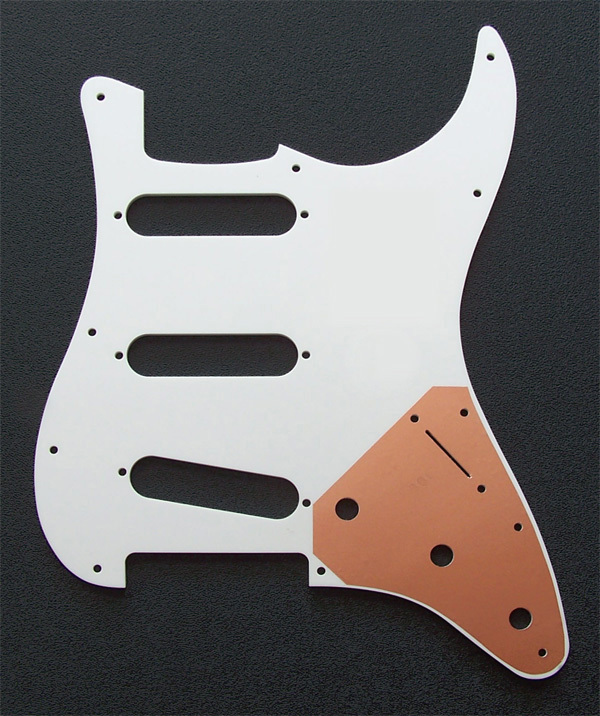 The pickguards mounting holes are then countersunk, copper foil shielding tape is applied to the control region and a final polishing of the entire pickguard is completed. It’s a fairly long process to create one of these unique pickguards, but we feel that final product is one that stands above the typical Strat® pickguard that have been produced the same way for over 50 years. This unique rounded and polished pickguard edge is only available on our Black or White 1 Ply 0.120" Acrylic pickguards. Pickup and 5-way switch mounting holes are not countersunk and require round head mounting screws. IMPORTANT NOTE: If you are planning on using a 22 fret neck with this 0.120" thick pickguard some body and neck combinations may experience clearance issues with the 22'nd fret overhang coming in contact with the surface pickguard. However, if you can measure the clearance between the underside of your 22'nd fret overhang and the top of your current 0.90" thick 3 ply pickguard and you can measure at least 0.035" then the Black 1 Ply 0.120" Rounded and Polished Edge Acrylic pickguard should work fine. Typical automotive feeler gauges should work fine to determine this clearance or you could use an old "D" string (0.035") and see if it will slip underneath your 22'nd fret overhang, this is a simple tool that works quite effectively. Remember, if you are adding the Full Coverage Aluminum Pickguard Shield to your order, you will be adding 0.012" to the overall pickguard thickness, so be sure to factor in this additional figure into your measurements of your 22'nd fret overhang clearance. Typical turn-around time from order placement to shipment is up to 21 days. Holiday work-loads sometimes may increase turn-around time, but keep in mind, we don't waste any time in getting these prepared, packed and shipped on their way to you. 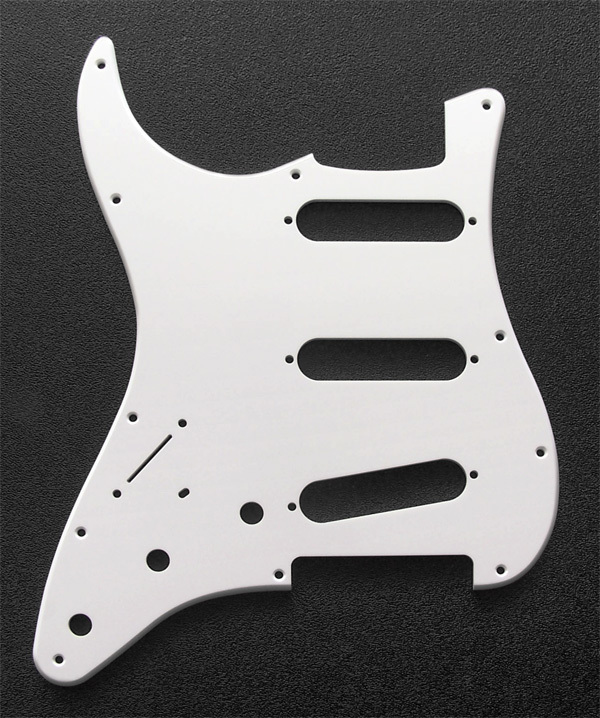 Each pickguard is custom manufactured for each customer and does not qualify for return, exchange or refund. Home All prices are subject to change. All orders are subject to product availability. All prices are in USD. OverDrive Custom Guitar Works reserves the right to cancel any order. Fender®, Strat®, Stratocaster®, Tele® & Telecaster® are registered trademarks of the Fender Musical Instrument Corporation. OverDrive Custom Guitar Works is not affiliated with Fender Musical Instrument Corporation. All content and photography are the sole property of OverDrive Custom Guitar Works and are not public domain. Unauthorized duplication or usage of any content of the OverDrive Custom Guitar Works web site is strictly prohibited. OverDrive Custom Guitar Works is an authorized Fender® parts and accessories dealer, authorized Seymour Duncan dealer and an authorized Allparts dealer.